July | 2014 | Every good thing…. 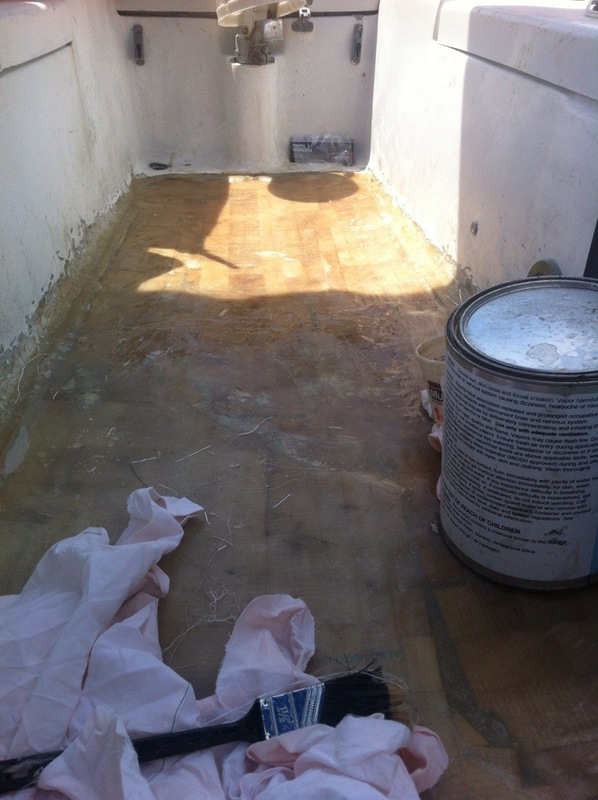 Fiberglass work. Just a bit delayed. Ok, I should write a little more but we have been very busy. 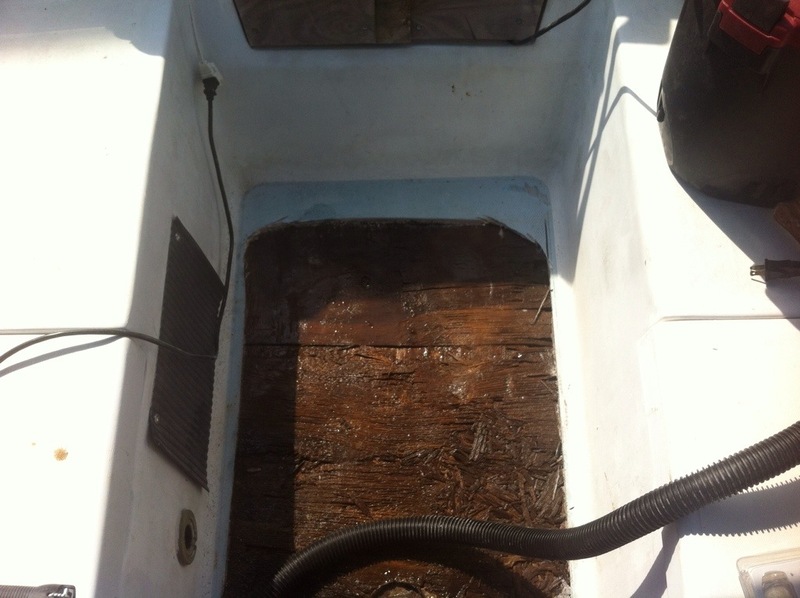 Before busting out the saw..
We finally decided it was time to fix the cockpit floor. 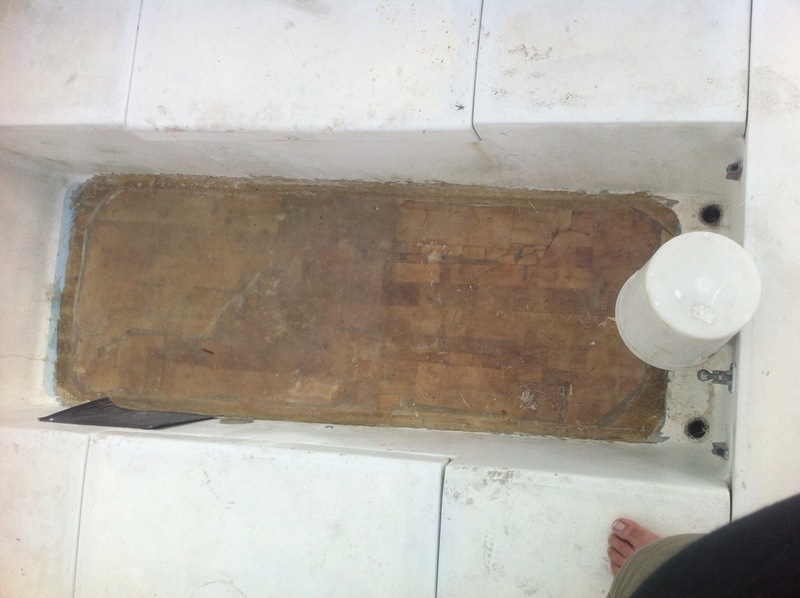 I had water in the plywood core and had a feel similar to stepping on a waterbed. I broke out the grinder and circular saw and cut it out. 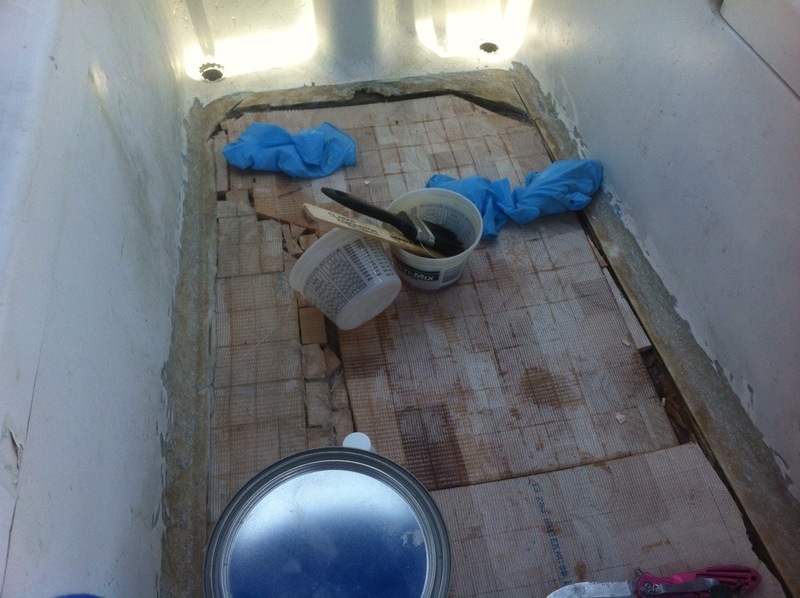 After cutting a slot about 1/4″ deep around the entire edge of the floor I peeled up the deck and exposed the rotten ply. 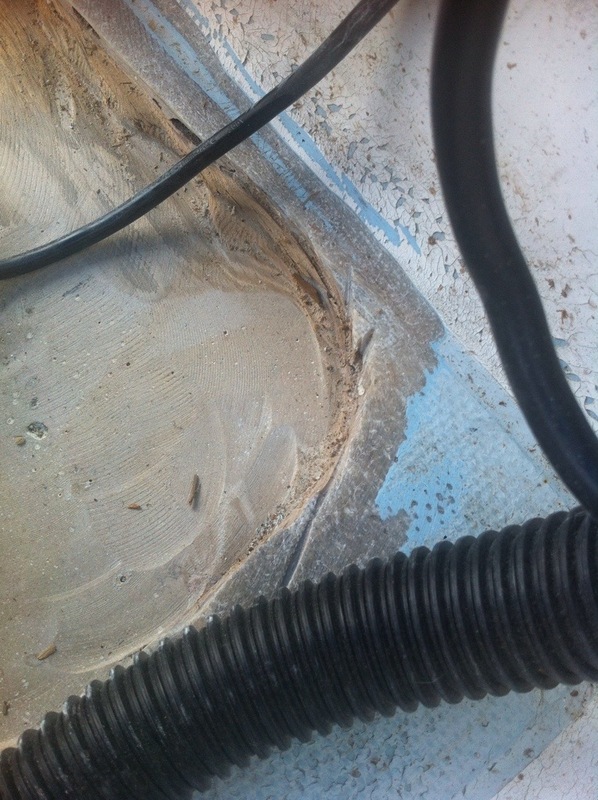 After removing the funky rotten ply I had standing water. 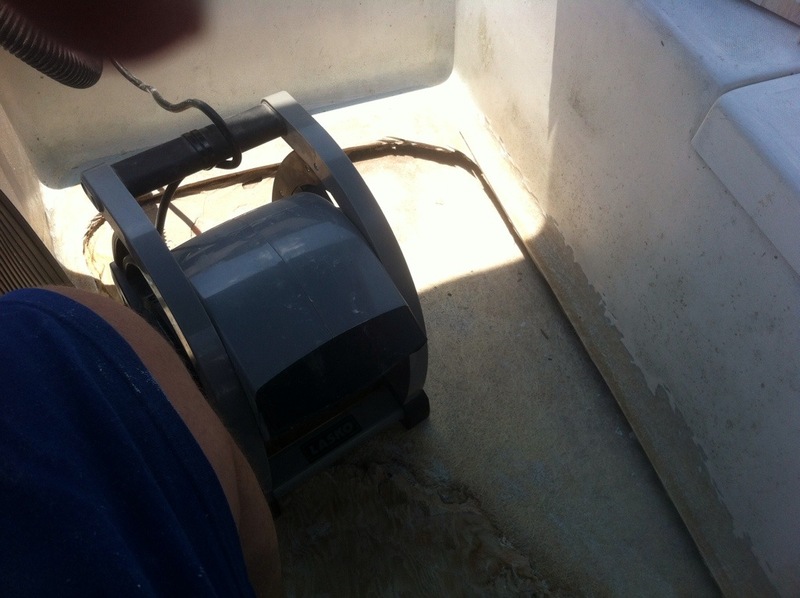 I shop vacuumed it out and set up our blower to dry out what was left. 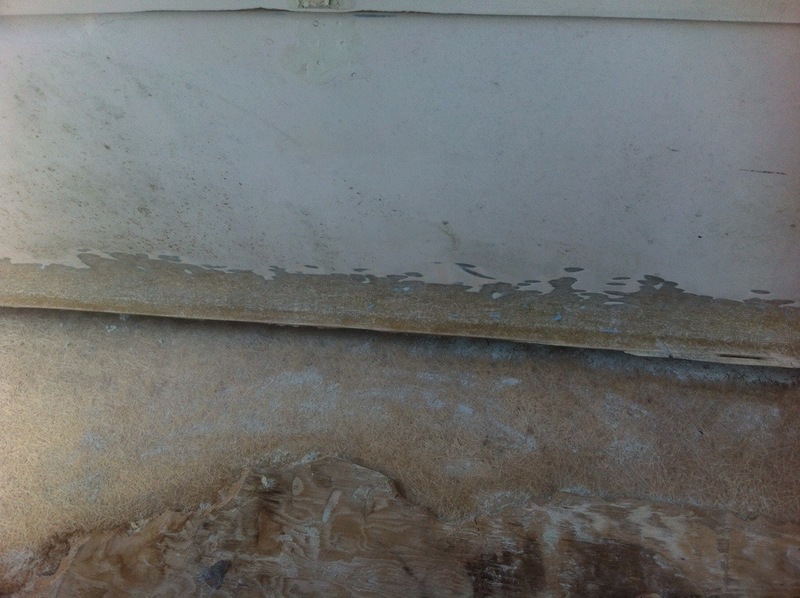 The remains are what is a wood and stop rot epoxy combination. 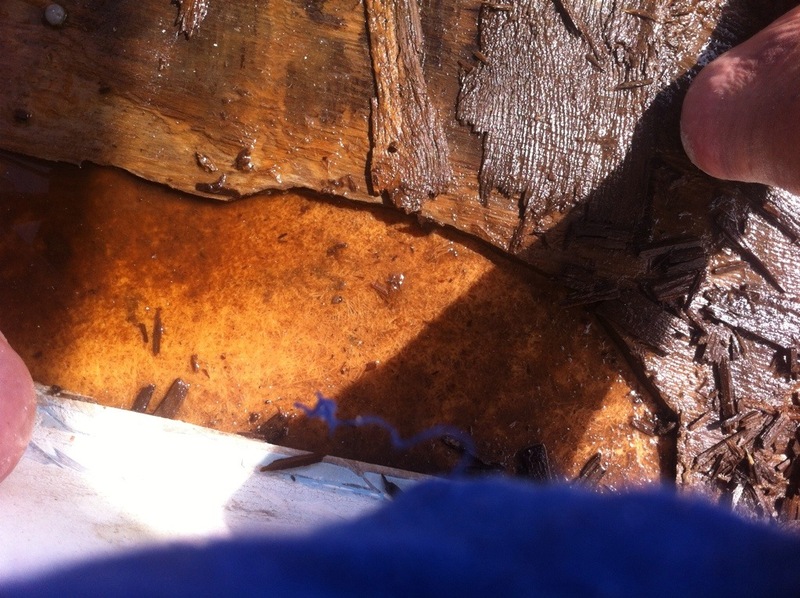 It seems the previous owner had poured stop rot down the hole in the deck to firm it up. Of course there was no way to control how it flowed. 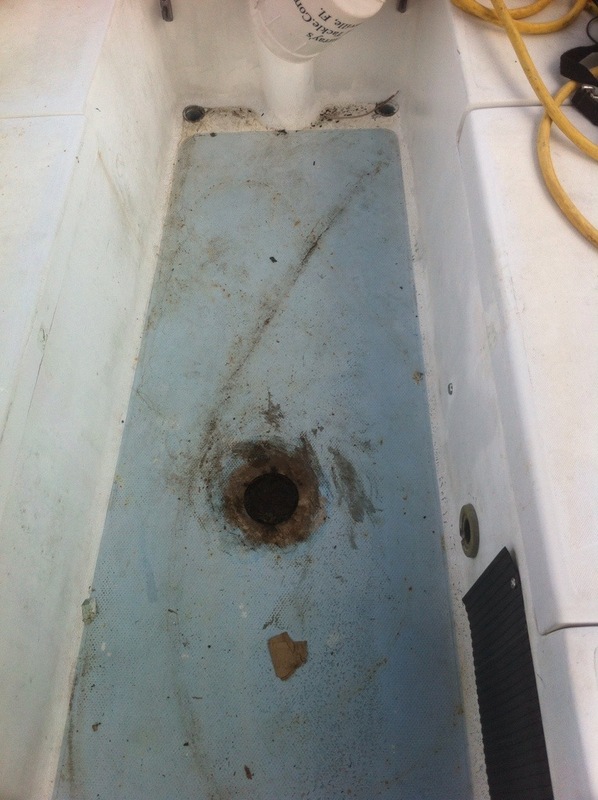 It appears the boat had a Port list when they poured it due to the the way it flowed in. 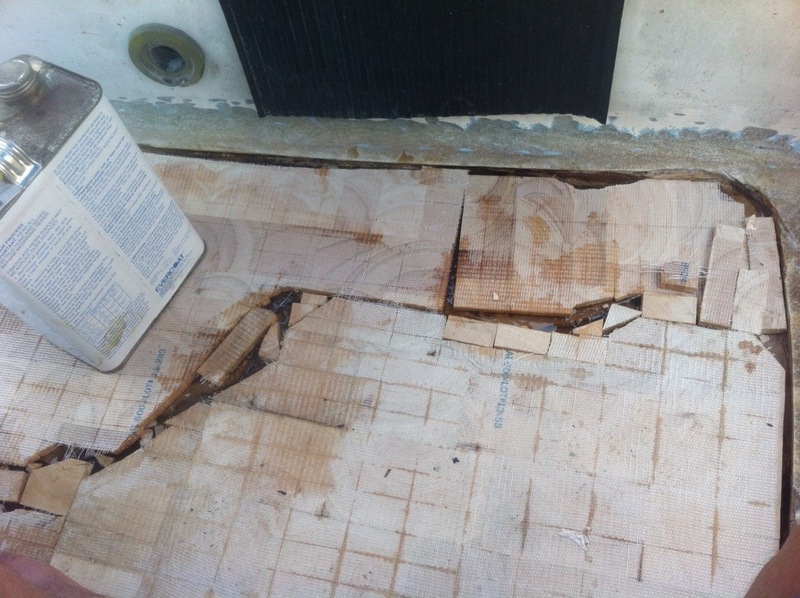 The stop rot had only penetrated the bottom portion of the plywood. Leaving the top 3/8″ to rot. I started to grind it away but after an hour decided to leave it in place. To compensate for the now 2 separate levels I had to buy both 3/4″ and 3/8″ balsa core to build up a level base to glass over. 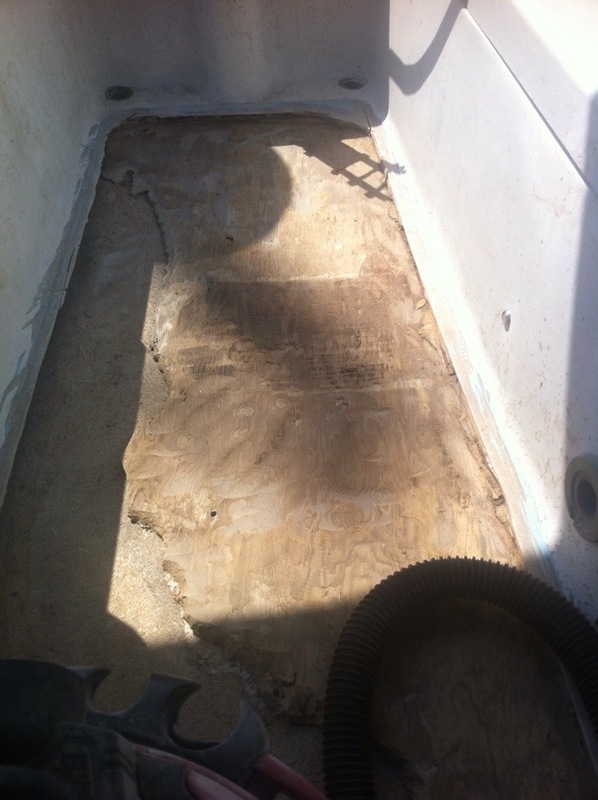 I had to prep the area around the opening, grinding it down to bare polyester glass (what the boat is made of) that the new glass can adhere to. After prep and cleaning I put in the the new core. 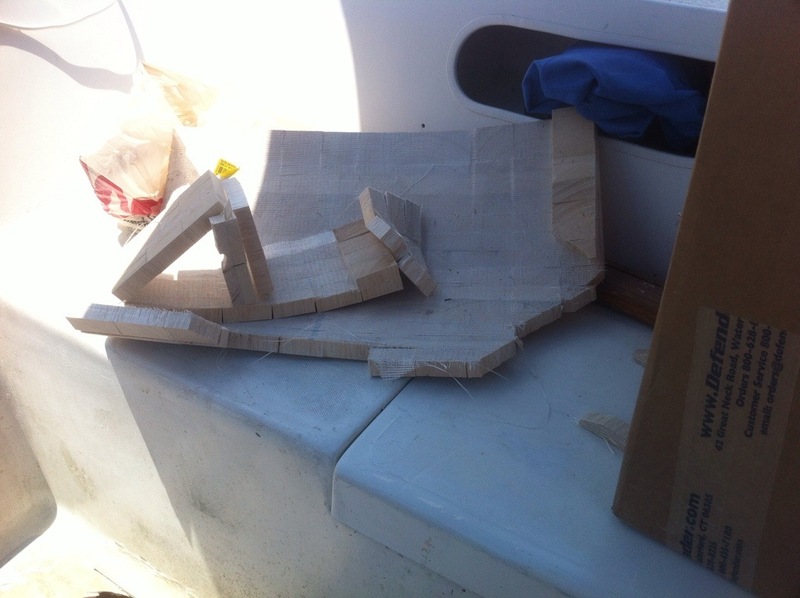 Balsa Core, placed with Polyester resin the 2 distinct areas can be seen. 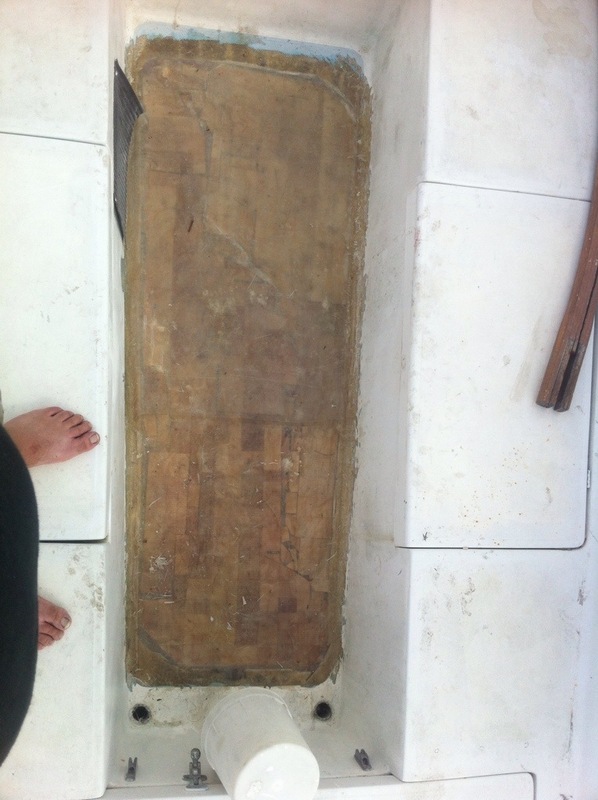 After putting the balsa I put some matting and then glass cloth. I currently have 2 layers of cloth and one of mat on the floor. 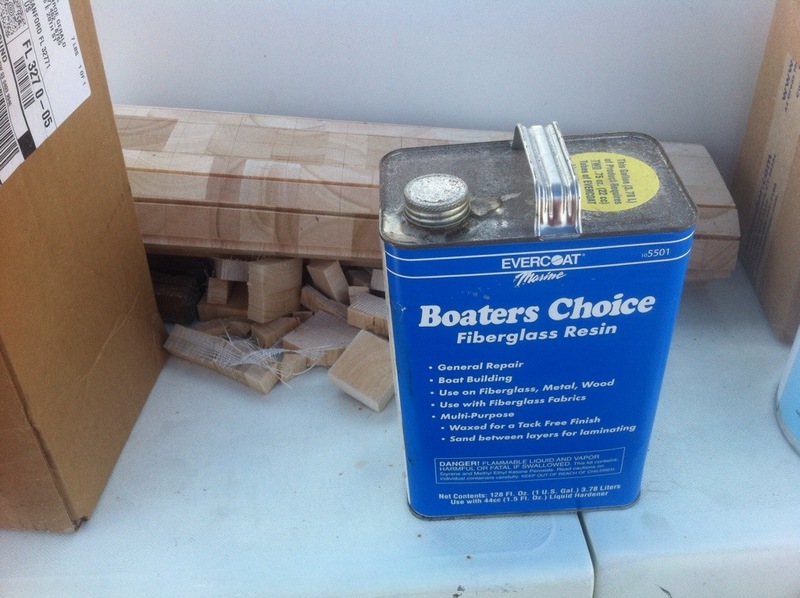 The first type of Polyester resin I used was a gallon of Boaters Choice. This stuff was horrible. Although it works it had a lot of odor and always seemed to have a slight tacky feel after setting up. The bottles the hardener it came with were hard to measure from and messy to handle. 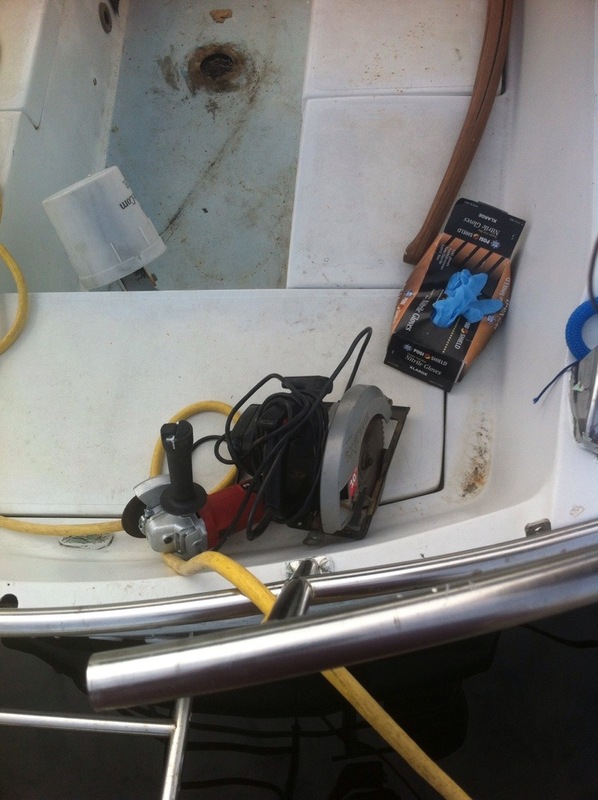 The second gallon I have been using is Boatyard, it seems a lot better in all aspects than the cheaper Boaters choice. I imagine West Systems is better yet but have yet to try it. I left it at this point, with enough glass and resin in place to keep water out of the core. We had tropical storm Arthur brewing off the coast so further work was becoming impractical due to high wind and rain squalls. I want to apply 3 more pieces of glass cloth and then level it out with resin and micro balloons. I hope to only have one more solid day of work before priming, painting the entire cockpit and applying KiwiGrip nonskid to the floor. We bought another Atomic 4 on Ebay for $120. 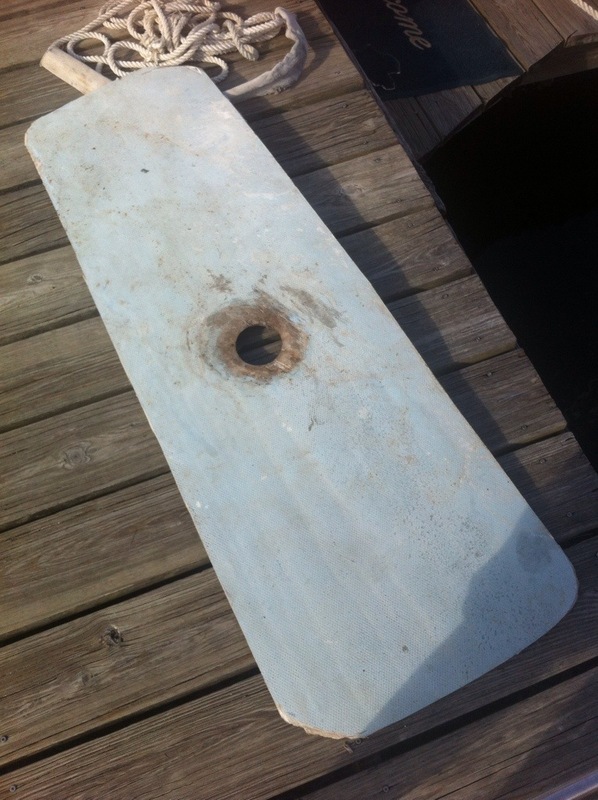 This one is in a bit better shape on the waterjacket side with no major corrosion failure. I plan to take it down to the block and get the cylinders resleeved. I will be using the lower section and transmission from out 64 motor and choosing the best parts from both for the rebuild. A lot of work but we should end up with a very nice motor.